When people consider relocating to Palm Gardens’ AZ mobile home parks, they take into consideration the great weather, the myriad of activities, and the location; but what many don’t think about is the proximity to nature and Arizona’s beautiful wildlife. While many Arizona mobile home parks are frequented by desert birds like quail, hummingbirds, and doves, there are numerous mammalian species who call Arizona home. Bats! According to the Arizona-Sonora Desert Museum, bats make up one of the most diverse orders of mammals, comprising nearly a quarter of the world’s mammalian fauna. There are eighteen varieties of bats in Arizona alone, including the Peter’s Ghost-face bat, three species of leaf-nosed bats, nine varieties of plain-nosed bats, and five free-tailed bats. Rabbits! Those cute little bunnies seen grazing in the lawns of AZ mobile home parks are most likely desert cottontail rabbits. Also common to the valley is the black-tailed jackrabbit, and in southern Arizona the antelope jackrabbit. Javelina! These collared peccaries weigh between 40 and 55 pounds and resemble small wild boars. They live in herds of anywhere from 2 to 20 animals and thrive in areas with sufficient prickly pear and other cacti. Because they have poor vision, javelinas rely on an excellent sense of smell and can be quite aggressive when threatened. Deer! The lower foothills and brushy canyons of the desert are home to hule deer, while white-tailed deer live at the higher elevations in the mountains. Pronghorn deer are listed as endangered but herds in some places are doing quite well. Bighorn Sheep! These majestic mountain sheep have declined in numbers due to human encroachment and competition with domestic sheep and burros, but reintroduced populations are increasing in numbers. Elusive and staying to the rocky desert mountains and canyons, they are unlikely to be spotted near the city limits. Coyotes! 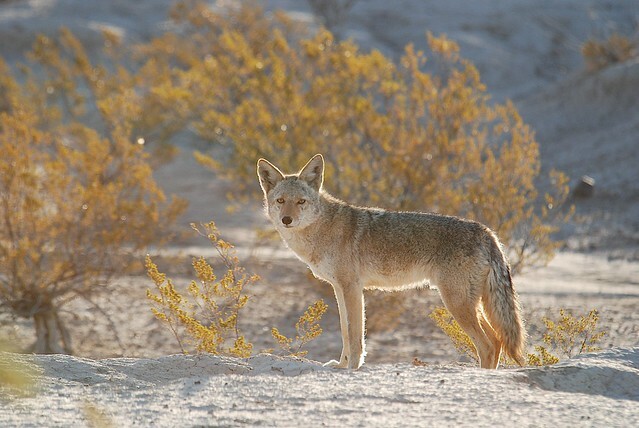 The most famous of all desert animals is the coyote. The “trickster” and “wise one” in Native American mythology, he is an incredibly intelligent and adaptable animal. Coyotes can survive on anything from saguaro fruit to road kill and are just as home in the desert as the city. For more information on the flora and fauna of the Arizona desert, visit the Arizona-Sonora Desert Museum just south of Tucson!